Jewish students across campus can receive discounted or even free mezuzahs for their dorms, apartments, and houses thanks to a special fund that supports purchasing a mezuzah from Chabad at this university. The Mezuzah Fund is sponsored by the Helfgott family in honor of Jack Helfgott. Yonatan Helfgott, an alumnus of this university who lives in the D.C. area, started the program last September in honor of his father. Jack Helfgott died suddenly two years ago at the age of 63 from a heart attack. “He was very passionate about being Jewish and supporting Jewish causes,” said Helfgott. Jack Helfgott was inspired by his own parents, two Holocaust survivors, to stay connected to his Jewish roots and decided to volunteer in the Peace Corps in Micronesia. He later moved to Israel and joined Israeli Army Golani Special Forces unit. Jack inspired his own son, Yonatan, to connect to his Jewish heritage and identity. Yonatan Helfgott thought it was appropriate to sponsor Rabbi Eli Bachman’s mezuzah campaign, which sells and installs mezuzahs for students around campus because the mezuzah represents Jewish identity – something that reflects his father’s ideals and actions. The fund was created so that no student would be deprived the opportunity of having a mezuzah.The Mezuzah Fund accepts donations and sponsorships to help with its distribution. A mezuzah is a case that holds a parchment scroll with the Shema, a Jewish prayer said every morning and evening, written on it by a scribe. Mezuzahs are placed on the right side of doorposts either on the front door or on multiple doors around a home as a symbol of God’s blessing over the home and a reminder of God and heritage. Junior neurophysiology major Ariel Peritt received mezuzahs for multiple rooms in her apartment from the program last year and felt it was a connection she could bring from home to this university. Students who want a mezuzah can work with the program to get the whole or partial cost of a mezuzah covered, thanks to donations from the Helfgott family. Mezuzahs cost approximately $30 to make. Students fill out an interest form on the Chabad website and can choose to pay part of the cost for the mezuzah or get it for free, depending on their financial need. The program delivers and installs the mezuzah for the student. Rabbi Backman said the goal of the program is to continue a practice and tradition that many students grew up with. Chabad, students’ “Jewish home away from home,” assists Jewish students with fulfilling their spiritual needs. Chabad at this university is run by Rabbi Backman and his family. This fall, Backman documented mezuzah hanging in students’ dorms. Students pose after hanging up a mezuzah on their door. Photo courtesy of Eli Backman. Freshman international business major Rachel Brynien said she felt something was missing in the weeks after moving in because she forgot to put a mezuzah on her door. Adding it also brought her closer to her roommate, who she met on gap year in Israel. 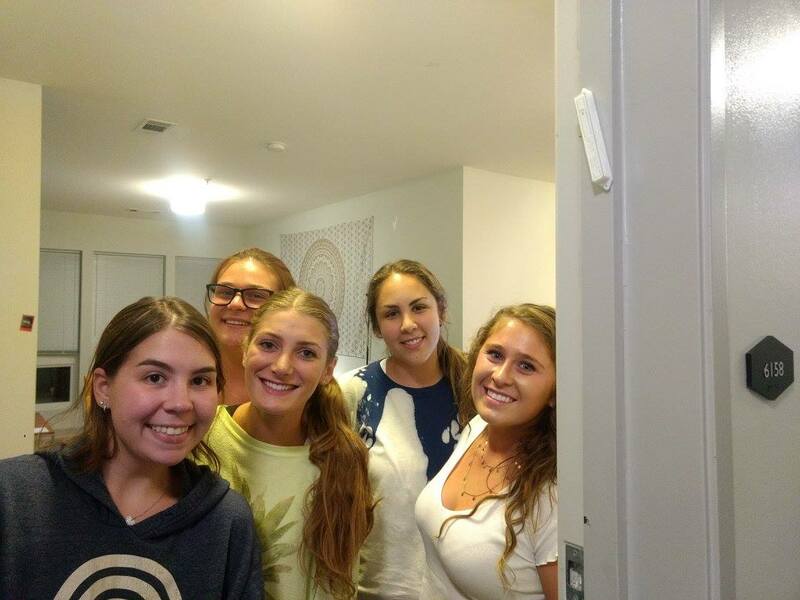 “Putting a mezuzah up was kind of our way of coming together and really connecting with each other and making our dorm room feel more like our home,” Brynien said. Backman believes many students choose to get mezuzahs for their campus housing because it is something many grew up with and creates a sense of home for them. Some students did not know that the program provided mezuzahs and brought them from home free of cost. Junior criminology and criminal justice major Talia Stewart and her roommate decided to bring one from home and put it on their bedroom door in their sorority house. However, she said not being aware of the program made no difference to her as she wanted to choose a decorative mezuzah. Students interested in receiving a mezuzah from the program can visit the Mezuzah Fund to apply for one. No Replies to "Mezuzah program provides students with sense of home, identity"